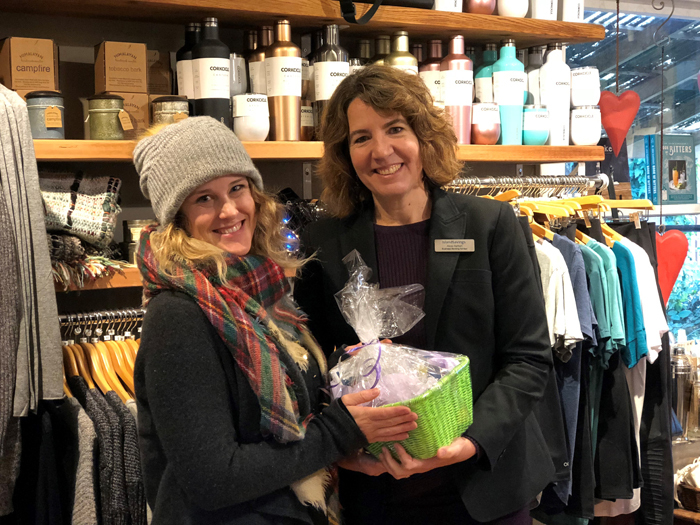 Twang & Pearl store manager Teile McDonald, left, receives a Fan Choice Award from local Island Savings business banking advisor Alicia Herbert. Many changes have been happening in our business community on Salt Spring Island. • A new executive director has been hired by the Salt Spring Chamber of Commerce. Jessica Harkema will replace former executive director Janet Clouston. We look forward to seeing and working with Jessica, who begins her new duties on Feb. 4. • Sarah and Nino Barrette, the owners of the recently opened store Inspired, bring many years of retail experience to this new business. They are looking forward to working with local artisans and offering quality products to their customers. Inspired is located in the former Fever Tree location. • Becka and Bryan Heck and Geordie Gordon are the new owners of Cafe Talia. After three and a half years as owner, Aletha Humphreys has moved on to focus on her executive director role at Greenwoods Eldercare Society. • Merchants Mews news includes the new arrival of BE Design, which moved its location in December and is all unpacked and ready to serve up the same great products and service you received in the Ganges location. Jana Roerick, owner/operator of Jana’s Bake Shop in Merchants Mews, tells us that effective April 1st (no fooling!) she will no longer sell a daily showcase and coffee, and will close her doors to walk-in traffic. However, showcase products will continue to be available at Café Talia, with new owners Becka, Bryan and Geordie, and at Bean Drinkin’ Café, Jana’s Bake Shop’s newest partner, with owner Taylor Booth. • On Jan. 31 after 25 years, we will have to say good-bye to Kim Young, a long-time manager at Mouat’s Home Hardware. Kim’s wonderful and audacious sense of humour made her a joy to be around for staff and customers alike. Kim will be heading back to join her family in Port Hardy, where she grew up. • Congratulations to Salt Spring Marina, whose dock replacement project is underway after more than 13 years of planning. The old structure was due for replacement about 20 years ago. • Gulf Island Organics, a new cannabis dispensary, has opened across from Mahon Hall. • Island Savings, a division of First West Credit Union, has announced the winners of the 2018 Fan Choice Awards. Among them are three Salt Spring Island businesses: Twang & Pearl, Auntie Pesto’s restaurant and Salt Spring’s fitness hub North End Fitness. • Transition Salt Spring Enterprise Co-op (TSSEC) could offer financial assistance to many green businesses in 2019. TSSEC is an investment co-op that was created to allow islanders to invest in local projects that are both environmentally and economically sustainable, offering access to affordable financing. TSSEC celebrated Co-op Month in late 2018 by providing its 16th loan, thereby passing the $100,000 milestone of microloans issued to green projects and businesses on Salt Spring. Five transportation-related projects have been provided with loans, including Salt Spring’s first electric vehicle charging station at ArtSpring, two loans to Island Pathways, OutSpokin Bike Shop and Coast Alive Ecological and Recreational Services for an electric bicycle and trailer. These projects help Salt Springers reduce dependence on fossil fuels. Other businesses that have benefitted from the co-op loans include the SSI Agricultural Alliance for the community abattoir, Black Horse Apiary and Salt Spring Sea Salt, Bohemia Consignment, Axe & Reel Outdoor Emporium, and Shepherd Shoes, which each received a co-op loan. For more details or to find out how to join the co-op or to apply for a loan, please email TSSEnterpriseCoop@gmail.com or call 250-537-2616. Independent businesses help give our community its distinct personality. Studies show each dollar you spend at local businesses returns three times more money to our local economy.